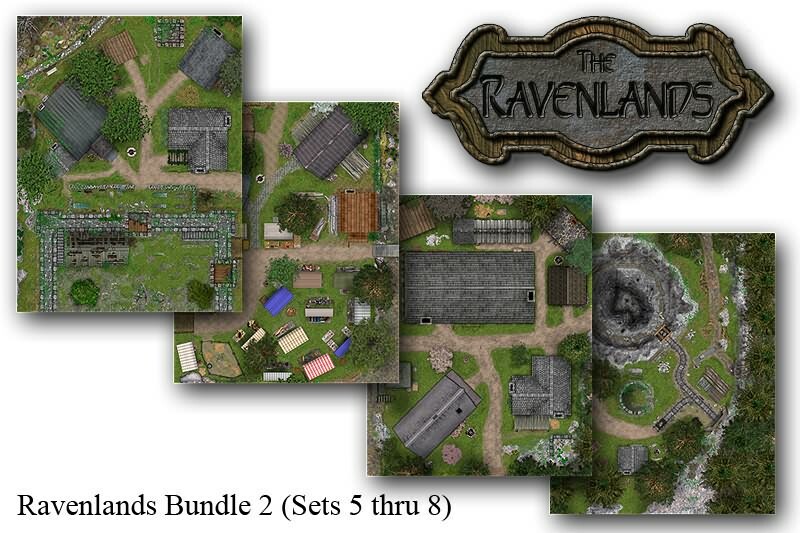 "Ravenlands Map Pack 2" is a collection of 4 maps and 4 Fog of War Overlays. Produced by Scrying Eye Games, this artpack contains Maps 5 through 8 of their Ravenlands series of exquisitely detailed and interconnected maps. A 32 x 20 cell Overview Map (at a scale of 15 feet per cell) is also included, which shows how the first 8 maps in the Ravenlands series interconnect. 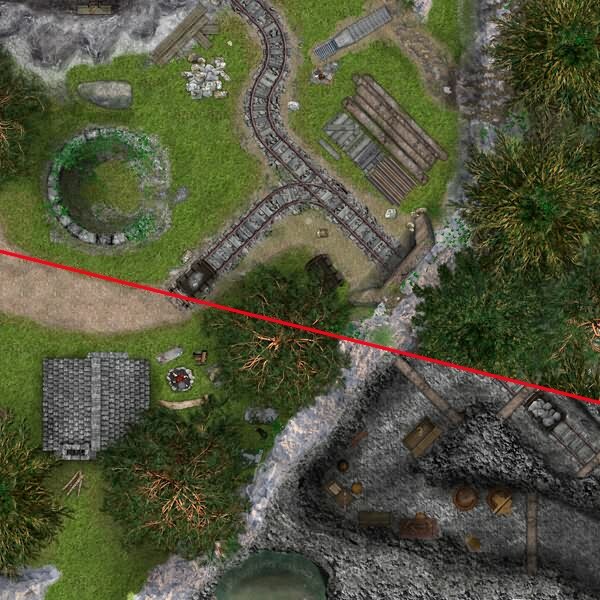 The above picture shows how the Fog of War Overlays can be used to mask things like the interiors of buildings or caves until the adventuring party enters and explores the area. All the maps and Fog of War Overlays in this artpack are designed to be displayed in BRPG at a setting of 24 x 30 cells. They are sized at 122 pixels per cell, the maximum resolution supported in BRPG, so there will be no pixelation even at the highest zoom setting. The Fog of War Overlays may also be deployed as maps, if you wish. Only the GM needs to have this artpack installed; players do not need to purchase or install this artpack at all. Note that BRPG v1.3d or higher is needed to use artpacks (and because BRPG v1.3d is still in beta, some of you may wish to hold off on purchasing this artpack until v1.3d is out of beta). This artpack costs $10, and is available for ordering from the BRPG Store page. The maps are also available in print resolution and in various game scales at the Scrying Eye Games website, for $4.95 each. The free "Adventure Seeds" PDF found here might be of interest to customers who have purchased this map pack.